NOTE: Where words are illegible or ambiguous I have inserted (???). 1. 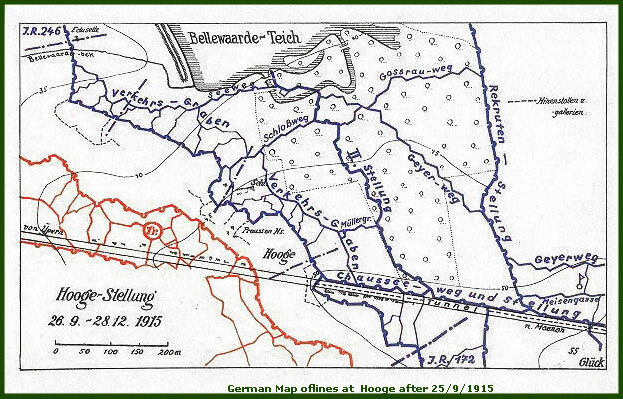 The 8th Bde will attack the enemy’s position on the morning of 25th September 1915. 3. Objective From J.13.C.4.8 -- J.13.C.6.8—J.13.C.7.9.—J.13. a C76.19—J.13.a.2.2—J.13.a.2.1 all inclusive. Bombing squads distributed along front line according to where the trenches they are to bomb are situated – see bombing ??? ½ D Coy and ½ C Coy move forward at same time and go straight for their objective. 3 machine guns will accompany this line. The dividing line between C and D Coys will be J.13.C.3.9 – J.13.A.6.0 both points inclusive to D Coy. These bombers will not use bombs unless absolutely necessary and will be fully armed and carry 6 bombs each, which if not required when position is secured will be passed to Bttn Bombers in front. ½ B Coy in C.1.8 will at 4.20am reoccupy our old front line from juncture of old C.2 to Piccadilly Circus. The Pioneers and RE will at once open up CT from APPENDIX to near J.13.C.4.8. ½ Section J13.a.2.0 bomb towards J.12.a.5.0. divide at J.12.a.5.0 to J 13.a.5.3.- J13.a.6.1. 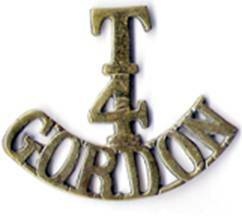 Two minutes after third line has started ½ section Gordon Hrs from Bomb Store in next trench carrying bombs will make for J.13.C4.d 1/2 Section ???? from bomb store on Piccadilly Circus will make for J.13.C.3.9 these squads will move backwards and forwards to bring up bombs. 8. Signallers. The following permanent stations will be established. 9. Reserve Ammunition nr Battn Hd Qtrs also in front line trenches. 14. ½ of B Coy in enemy’s front line will ??? CTs ?? 16. Men will carry their ?? rations in their haversacks. Not to be taken forward of your dugout. To be returned here today. ½ B Coy in front line. MG and bombers will be in position by 2.45am. Men bust be warned to move silently to their places of assembly. Great care being taken not to show themselves on their way there, or when there special care being taken to conceal bayonets. OC C and D Coys will arrange that our wire in front of their trenches is cleared by midnight. Reference O. Order No1 para3 erase J13 and 7.1 and substitute J.13.C.6.9 and J 13 A. 6.1 It will be see n that point Y1 is not included in your objective. However, examination of post war records of Soldiers and Officers Died (see below) indicate that the true number of fatalities was significantly higher. Well over half of those posted as “Missing” in the Battalion War Diary (most from C & D Coys) were subsequently reported killed. Why this was not reported in the regimental history published in 1958 is unclear. The final count of those killed appears to be 7 officers and 90 O/Rs. The wounded are far harder to account for precisely, but if the figures used by Falls (above) drawing on the War Diary are accurate, then the total of killed or wounded is 245 out of a “strength into the line” (several days earlier) of 641 (McConachie reports 657). This represents an almost 40% casualty rate. In trenches in SANCTUARY WOOD busy getting everything ready for attack. Copy of operation orders attached. ½ of D Coy and ½ of C Coy advanced and the other half advanced from our second line trenches. Our 1st and 2nd line got into German trenches with little loss. Found many Germans in it most of whom bolted. 3rd line advanced over this trench and along with second line, advanced to objective. Certain amount of confusion. Germans met with in considerable numbers in the open and in the trenches and a good bit of rifle fire and hand to hand fighting but all were soon captured, killed or escaped. Reports gradually got back saying the objective had been gained. At the same time 1 off and 9 RE attached and 25 Battalion pioneers under Lt. Waddell started to work on CT from Appendix to German line, but after a short time had to stop owing to heavy fire from artillery several of the pioneers being killed. They went forward to help consolidate the furthest line taken by us. Germans started heavy bombardment of captured trenches in redoubt, reports came back telling of this and asking for shovels and sandbags to strengthen trenches. Some were sent up but did not arrive owing to shelling. It was almost impossible to get up bombs etc to the furthest line held by us as the German CTs were blocked by shell fire and anyone coming out into the open was fired at by rifle and machine gun fire coming from North of the MENIN ROAD. Reports came back from Capt Hopkinson that he was at point J.13. A 6 and that a field gun had been captured there. Sgt Forbes was killed at this point by a shell. Lieut. Henderson now in command of C Coy (Capt Reed having been wounded in the middle of the redoubt and carried back to our own lines by his servant) reported that he was at point J13 C 79 with 6 men he was afterwards driven back from this by shellfire. Heavy shelling from Germans all the time. Reinforcements were asked for by Coys in German 3rd line and half of B Coy under Capt Watson were sent up. Capt Watson was wounded in Appendix by a shell. One half of A Coy in reserve in B.8.S was sent to take the place of B Coy in C1 as supports. All our old trenches were being fairly heavily shelled by whiz bangs which made it very difficult to get up supplies of bombs etc even as far as the Appendix but it was done alright and a bomb reserve was made in German first line at point S13 C 3.9 but it was found almost impossible to take them further forward than there. Germans collected North of the Menin road and at about 11:30 – 12noon attacked from N and NE with bombing parties up the trenches and others over the open. Our bombers with some of the 1st GH who were isolated from their own battalion were driven back for want of bombs and the German bombers working along their old front line from the North forced out men to retire, but not before they had opened rapid fire on them killing a good many. Our men retired to the Royal Scots trenches and across the open through the wood to Appendix 2 B 8 where they were collected and lined the parapet of Appendix C1 and B8. They were well handled by 2 Lt Bain. The Germans 4 times tried to advance from their own front line into C1 and Appendix but each time were stopped by accurate fire of these men. The remainder of A coy was at once sent for to reinforce and hold our old front line all this time the Germans were accurately shelling our trenches with field guns, inflicting several casualties. The brigade was at once informed of the situation and asked to send reinforcements. Son of Mrs. E. M. Coutts, of 33, Dalhousie Terrace, Edinburgh, and the late Mr. R. A. Coutts. Son of Alexander R. Henderson, of 46, Beaconsfield Place, Aberdeen, and the late Elizabeth J. Thomson Henderson. M.A., Aberdeen University, and Teacher at Aboyne Higher Grade School, Aberdeenshire. Son of Jessie Low, of Dyce, Aberdeen, and the late William Low. Son of Alexander and Ellen Sarah Baker Morrison, of Turriff, Aberdeenshire. Son of William Sangster, J.P., and Mary Sangster, of 62, Rubislawden South, Aberdeen. M.A. (Aberdeen). Medical Student. Much is often rightly made of the localised impact upon communities of the casualties sustained on the Somme in July 1916, in particular amongst those units organised as Pals Battalions. Because of the very localised recruiting of the Territorial Forces, a similar and no less dramatic effect can be seen with the casualties from battles in 1915 like that at Hooge/Bellewaarde. plots the 1/4th Gordons casualties from this battle, on the basis of the addresses noted in the CWGC database. Although perhaps only 2/3rds of entries have addresses, the concentration in such a geographically small area is marked. The impact on the local community is obvious. It should be noted that other battalions of the Gordons were also in action (1st at Bellewaarde and the 2nd, 6th, 8th, 9th and 10th at Loos.) Based on the incomplete age data held in the CWGC records, the average age of O/Rs killed was 22 years and 5 months, this is skewed upwards slightly by the presence of a couple of individuals in their later thirties. Forbes was also a member of U-Company. 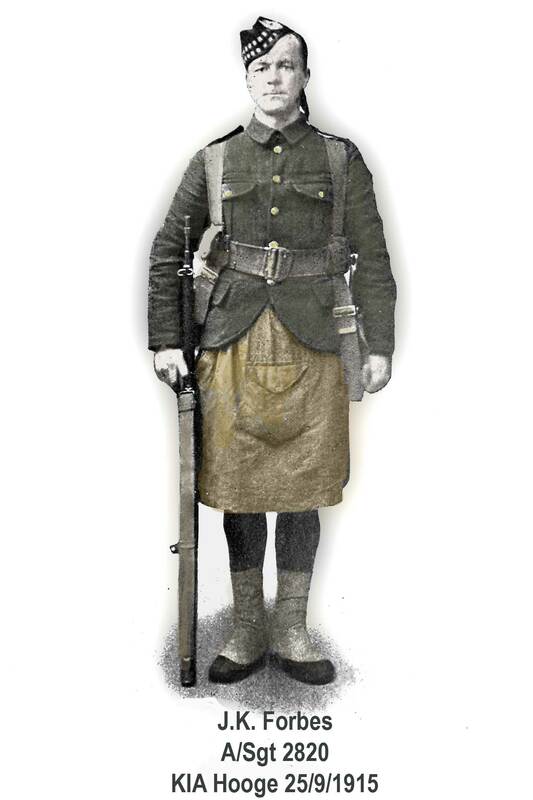 U Company was the Aberdeen University Company of the 1/4th and has the distinction of being the only university company to remain together and serve in one group as part of a battalion. U Coy became part of D Coy when the companies were "doubled", thus many of the men lost in the advanced group which was cut off appear to have been from the University Company. The story of this company - unusual to some extent in that numeous undergraduates and university graduates served, not as officers but as enlisted men, is well recounted in John McConachie's book "Student Soldiers" (Moravian Press 1995). In addition to Forbes' memoire and McConachie's look back, there is also a detailed account of this period in Alexander Rule's "Student Under Arms" (Aberdeen University Press 1934).